Responding to the brutal suppression of a protest staged on Monday night by refugees detained on Papua New Guinea’s Manus Island, the Liberal-National government has boasted of its draconian “border protection” regime. Prime Minister Tony Abbott and his colleagues are preparing a cover-up of the atrocity, while effectively welcoming what happened as a “deterrent” to other people thinking about seeking asylum in Australia. What is known is that a 23-year-old Iranian Kurd, Reza Berati, was killed, suffering unspecified head injuries, while another 77 refugees were injured, 13 seriously. One has been flown to an Australian hospital in a critical condition after suffering a skull fracture, another man was shot in the buttocks, while multiple witness reports indicate that another survivor had his throat slashed with a machete. Those responsible for the violence were likely Australian-funded Papua New Guinea (PNG) paramilitary police and detention centre security personnel. The statement amounted to a threat of further violence against any asylum seekers who protest against their illegal detention in the squalid Australian-run camps in the Pacific states of PNG and Nauru. The government was clearly preparing for a crackdown when it deployed an additional 130 security staff to the Manus camp on February 1–3. In a press conference on Tuesday, Morrison acknowledged that the refugee protests this week came as “no surprise to us, that is why the government was increasing security at the centre.” The minister explained that there had previously been a “rolling series” of what he acknowledged were “peaceful protests” of asylum seekers against the conditions in the camp. The reasons for the protests are obvious. The Manus Island camp was reopened in 2012 by the former Labor government, and currently detains 1,300 asylum seekers, all men, kept in indefinite detention in deliberately overcrowded and squalid conditions. The whole purpose of creating this hell-hole is to deter other asylum seekers from attempting to reach Australia by boat. An Amnesty International investigation of the Manus facility, published in December 2013, concluded that the Australian government was not only breaking international law governing the treatment of refugees but also violating its obligations under the UN Convention against Torture. It found that detainees were forced to queue for one to five hours a day for meals, toilets and showers and medical treatment, with almost no shade provided to protect people from the tropical heat. Tensions escalated sharply on Sunday afternoon, after a meeting at the camp organised by the PNG Immigration and Citizenship Services Authority. The details of what was said have not been released, but it was almost certainly bad news about asylum applications. Under the regime devised by former Labor Prime Minister Kevin Rudd, and maintained by the current government, even those who are found to be officially recognised refugees are denied asylum in Australia and permanently settled in PNG. According to Morrison’s own account, the refugees “became agitated and commenced chanting.” At 6.15 p.m., 35 detainees escaped the camp but “were quickly located and returned to the centre.” That evening there was “minor damage to the centre,” including broken light poles and detainees knocked over eight foot high internal and external metal fences. Nineteen asylum seekers subsequently received medical treatment for non-specified injuries, suggesting a crackdown by security guards. The following morning, Monday at 7 a.m., another provocation was staged by the camp authorities when eight refugees were arrested and detained at Lorengau Police Station, facing charges relating to criminal damage. These statements have since been exposed as outright lies—security personnel used extreme force against the refugees. Australian-funded PNG paramilitary police were also involved in the violence. Numerous witnesses, including refugees, detention centre staff and security guards testify to what happened. Several media outlets have also cited witnesses reporting that at least one person had their throat slit, with the ABC citing an unnamed G4S security guard confirming this. 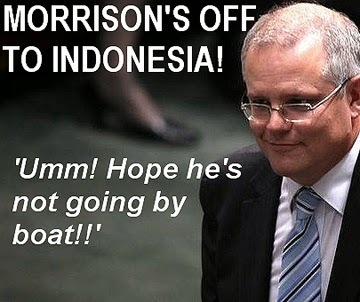 Morrison, however, has insisted that he “has no reports” of such an incident. Police officers from PNG’s paramilitary mobile squad were also involved in the violence. The mobile squad is notorious for its brutality, with numerous assaults, murders, and rapes catalogued by human rights organisations. The PNG government has previously deployed the mobile squad to suppress protests of local residents against lucrative logging and mining projects. Now the unit is on the Australian government payroll, with each officer receiving a $100 a day “living away allowance” from Canberra, an enormous sum in PNG. Scott Morrison admits that the PNG police fired at least two bursts of live rounds, at around 11.20 p.m. and 1 a.m. He maintains, however, that the police never entered the detention centre and only clashed with refugees who left the camp. According to the government’s account, external fences were torn down and several protestors moved outside before the PNG police responded. Several refugee advocate organisations, however, say that the asylum seekers fled in panic after security personnel entered the facility and began attacking people. 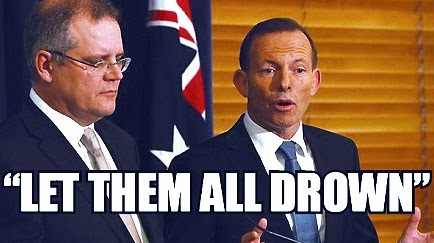 Prime Minister O’Neill is a trusted stooge of the Australian government. 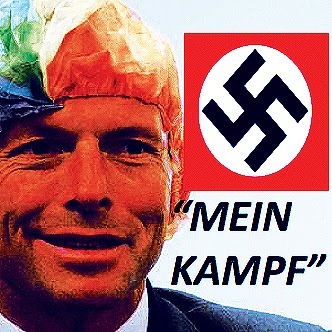 His government will collaborate with Canberra to suppress the truth of what happened on Manus Island. O’Neill issued a statement to the country’s parliament, declaring: “I am told that from the initial investigations, that there may have been some firearms in the camps as well.” This baseless accusation that the refugees were armed is aimed at providing a justification for the extreme violence inflicted by the police and security personnel. The Australian government has responded by doubling the number of security personnel at the Manus Island camp. 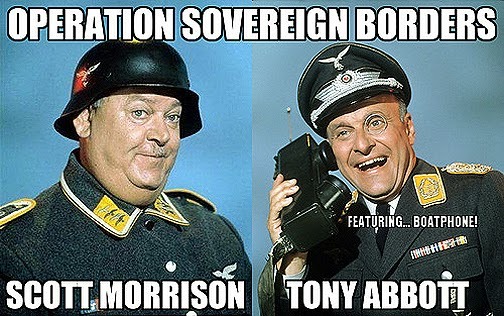 Morrison also dispatched Lieutenant General Angus Campbell, the commander of “Operation Sovereign Borders,” to the facility to assess the security situation. 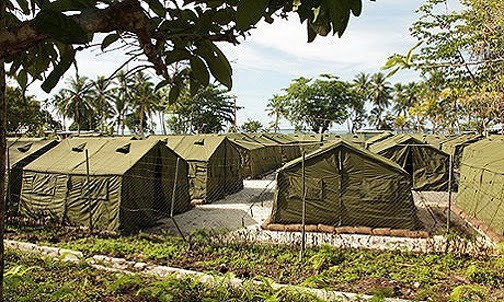 The unrest on Manus Island has all the hallmarks of a calculated provocation orchestrated by the Australian government to provide the pretext for a violent crackdown, designed to serve as a warning to asylum seekers within the detention regime and as a deterrent to others considering exercising their right under international law to seek refuge in Australia. The violent suppression of refugee protests underscores the extraordinary criminality that is central to the reactionary “border protection” regime that is supported by the entire Australian political establishment.